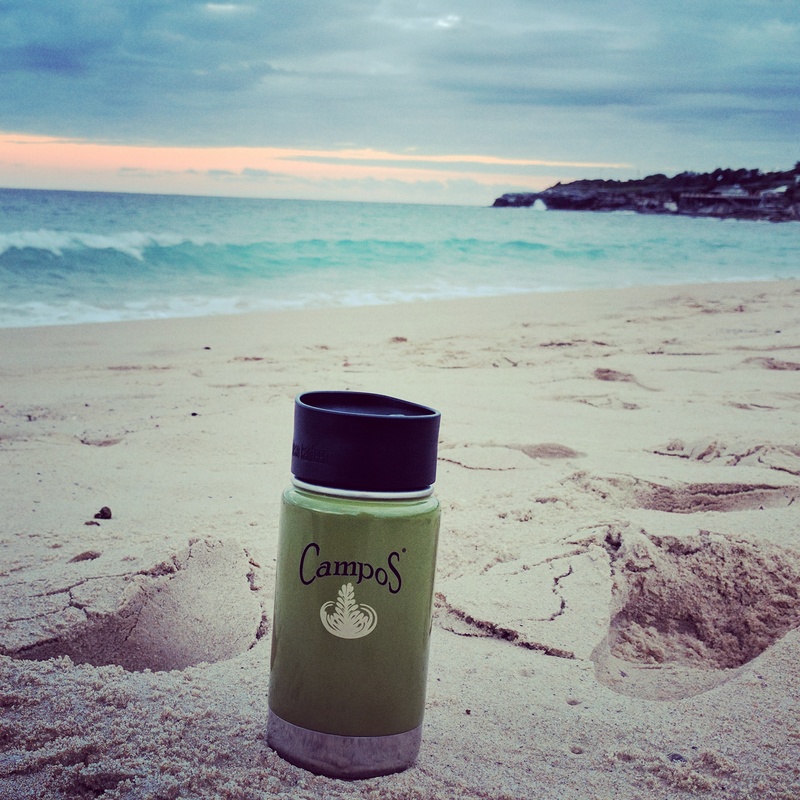 Similar to the beach…coffee deserves its very own blog post. 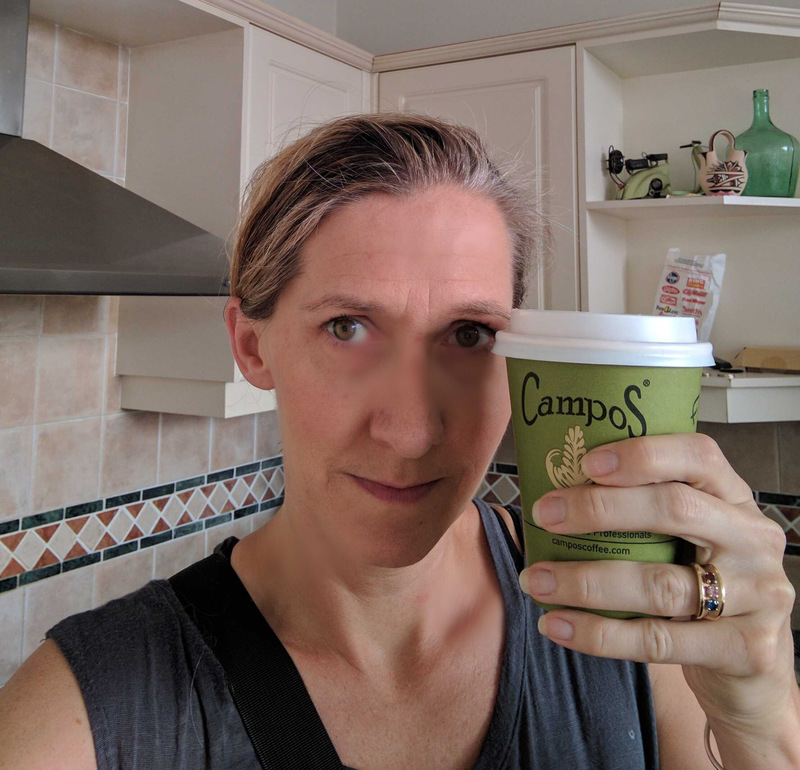 I’ve said it a million times to anyone I talk to back home…coffee in Australia is so, so, so good. And like the beach, it’s hard to put into words. You really just need to come and experience it for yourself. I’m no expert so I can’t really explain why it’s so good. I can tell you how it’s so different from USA and how much I will miss it when we go home. Day one…I walk down the street to get a coffee. It had been a LONG day/night of traveling. Our house had some sort of contraption that required coffee pods, so I couldn’t make coffee at the home. I walked into the first cafe I came across, which was right at the bottom of our street. I didn’t even know how to order or what to order. I’ve since learned so much. I think I got a latte because it seemed simple. This cafe became very important during our first week because we didn’t have any Australian currency at first, and they allowed me to use my credit card. It’s not as common here to use a credit card to pay for something under $10 or so. I learned this throughout that money-less week. A few places would charge a fee if you wanted to charge under $10. This cafe also had a JUMBO size…more on that later. This did not end up being my favorite place to purchase a coffee. It helped me in the beginning to get my feet wet with the coffee scene in Australia. They also gave a biscuit (cookie) with your coffee which Mae Mae enjoyed. Sadly, they ended up closing last month. Good memories there. As time went on, I was able to try out the variety of cafes on my block and tried some different drinks. I’ll try and explain it the best I can. How can coffee be different? Isn’t it universal? I remember going to Einstein’s Bagels in Denver a week before we left. We were with our Sydney friends. They told me a little about the coffee in Australia, so I had an inkling of what I was in for. I remember them saying you’ll never see those big vats of drip coffee in Australia. I also talked to the guy at Logan House Coffee in Stanley who told me that flat whites were popular in AUS. I’d never had one, but I remembered Starbucks introduced them as a new drink a while back. *Takeaway is also a term used when ordering coffee because otherwise, you will get it in a mug. 1. Size- Coffees here are small. So much smaller. I mentioned the JUMBO size…it was probably like a Starbucks grande. This took some getting used to since I have always been a venti drinker. Here is why…for the last 10 years, I’ve only had decaf. At home, I make a pot of decaf so I can drink 3 or 4 cups. If I go to Starbucks, I’ll have a decaf venti americano. I love coffee so much and one little cup isn’t enough. When we were packing up our house to move, I started to make half decaf/half regular pots. When we got here, many places charged extra for decaf and I was now drinking milky espresso drinks not nearly as strong as an americano from Starbucks. So I went for it and have been drinking full caffeine this whole time. I intens to go back to either half and half or decaf when I get home. Seriously, I’ve never seen coffee cups this small. I’ve learned to drink slowly and savor. Honestly, the thought of a venti (and Starbucks in general) is NOT appealing to me at all anymore. Here are some awkward selfies trying to demonstrate​ the size. 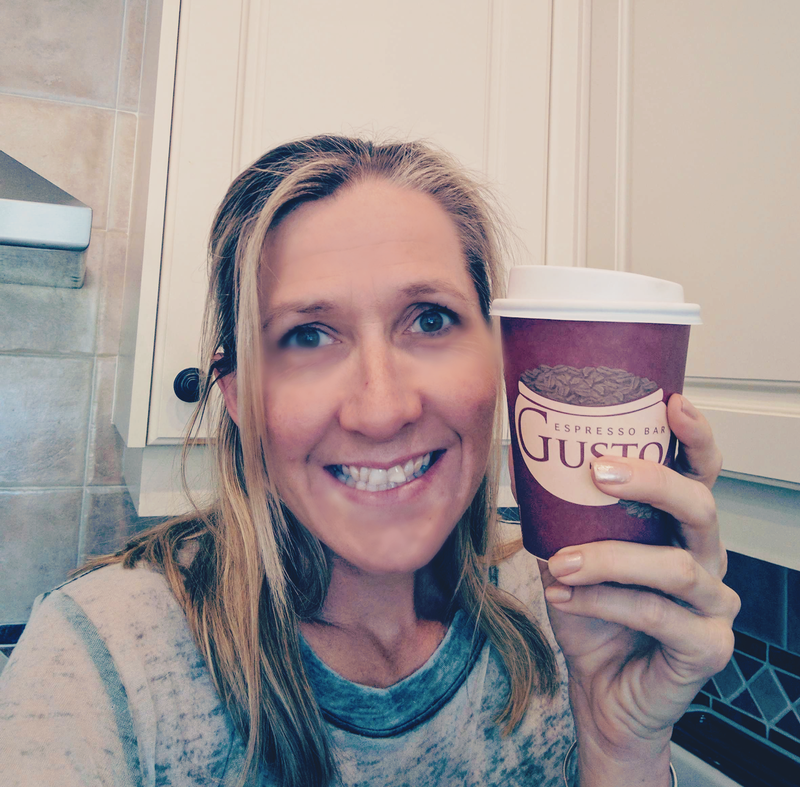 Sidenote: I didn’t even take these photos for the blog….they are from group texts with m’ sister wives back home trying to show them the coffee sizes because it blew my mind. 2. The Meaning of Coffee- The term “coffee” here seems to have a different meaning all together. To me, coffee means brewed coffee beans. Drip, pour over, french press. Just plain old coffee. People drink it black or add milk. I have never seen this here. I know. That seems crazy. So if someone offers you a coffee…they do NOT mean plain black drip coffee. It’s all espresso drinks. I know “regular coffee” exists, but it can’t be very common. Definitely not at cafes anyway. Probably in people’s homes. 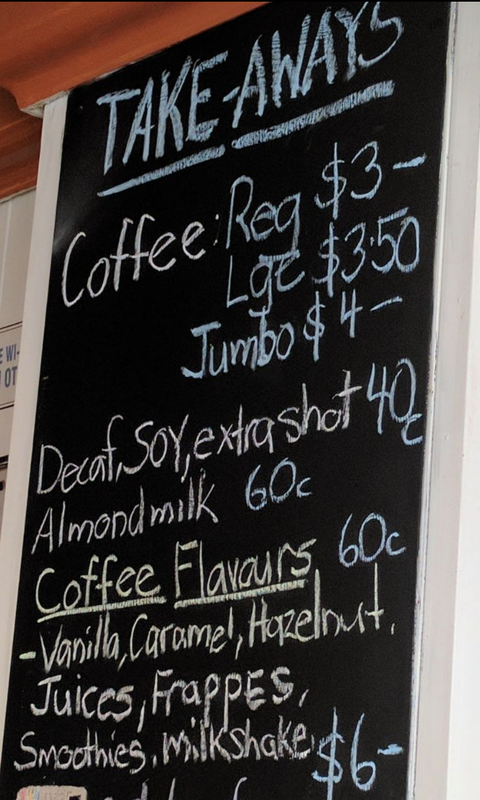 So…coffee means espresso drinks…latte, cappacinno, flat white, etc.. I’ve included pictures of menus from local Coogee cafes to give you an idea of what I mean. I suppose if you want plain-ish coffee you could order an americano, which is called a long black or a short black, but it’s still espresso. I was at the airport in Sydney, and I overheard a lady trying to order a coffee. The barista asked her what kind she wanted. The lady said, “Just coffee.” The barista responded, “No…do you want a latte or a flat white?” The lady got annoyed and said, “I just want a black coffee.” Nope. Wasn’t going to happen. This is NOT Dunkin Donuts. 3. Price- Coffee typically comes in one regular size. I’d liken it to a Starbucks tall. 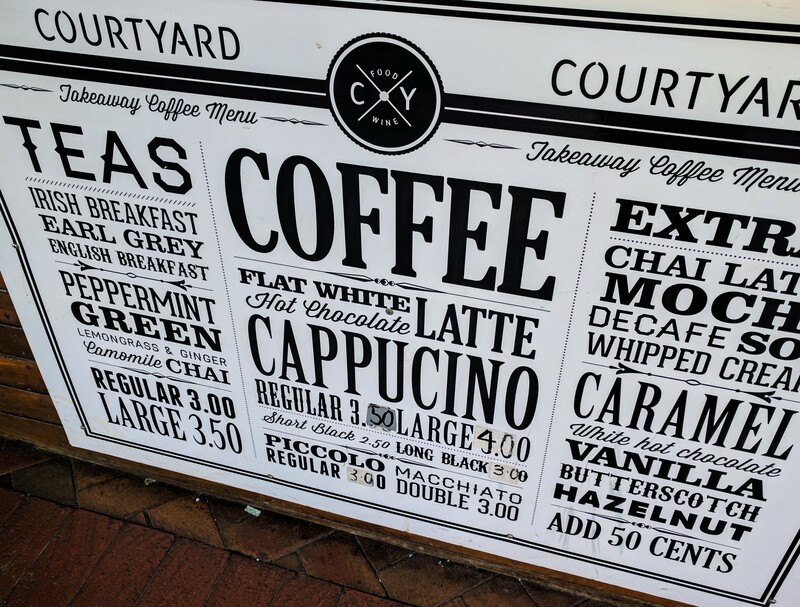 Usually, at most cafes, no matter what you order, a regular is one price. Then you can pay a bit more (around 50¢) for a large or other things like decaf or soy or maybe a flavor, but flavors don’t seem too common. This confused the heck out of me. It was so simple yet so complicated. Check out the menus below and see for yourself. There’s obviously some variety in pricing from cafe to cafe. I’ve seen places charge less for an americano and more for a mocha. A regular is typically around $3.00-4.00 and a large would usually be an extra 50¢…give or take. Again, I am NO expert. This is my anecdotal evidence of coffee culture. Have I mentioned it’s ALL delicious? When thinking about prices keep in mind, this is AUS currency. $4.00 in Australia currency (AUD) is about $2.96 In US dollars (USD.) And also the size of the cup has to be considered, too, when making the comparison. It’s very odd, still, that I bring 2 tiny gold coins to buy a coffee. I’ve probably never paid for a coffee in America with coins! Definitely not with just 2 coins anyway. 4. Availability- IT IS SOLD EVERYWHERE! This was also shocking to me. I mean…everywhere. The movies, a dry cleaner, clothing boutiques, on the ferry, grocery stores, McDonald’s, museums. I’ve seen coffee sold in the most unusual (to me) places. Almost every kind of business appears to have an espresso machine/barista set up and ready to serve you. At sit down restaurants, you can go to the counter and order a takeaway coffee. The kiosk by the beach/bus stop….full coffee menu. It’s so amazing to me that every kind of business is in on this. I tried to count how many different places I could get a coffee between my house and the beach and I stopped counting at 12. I live a block away from the beach!! And that’s just on my direct route. 5. My Drink- My coffee tastes have definitely changed due to geography. When I started drinking coffee way back in the 90s, my drink of choice was a Dunkin Donuts French Vanilla Light and Sweet. After kids, I switched that to a decaf. Then I moved to Storrs, CT and lived in walking distance to a Starbucks so I would get a Decaf Americano with vanilla. When I moved to Denver, Starbucks was still the place to go and I pretty much got the same drink with the occasional variation of soy milk or no vanilla. I like what I like and I don’t stray from my fav too often. I didn’t get these drinks on the daily…as I mentioned, I like to brew my own at home so Starbucks was a treat when I was meeting a friend or out and about. Not an every day habit. When I go back to the East Coast every summer, I’m so happy to visit Dunkin, but I haven’t been able to drink their hot coffee since I moved away in 2009. I’ve tried. Can’t do it. I can enjoy an iced coffee from DD with skim and 1 sugar. It has a murky color, and it’s more nostalgic than delicious. This brings me to Australia. I don’t like lattes at Starbucks because it feels like I’m drinking straight milk and they’re so expensive and mostly foam. That’s why I went for the americano. Here, the drinks are small enough that I don’t mind the milk. I get skim. And the flat white is way more coffee and less foam for my liking. So my new go-to is a skinny flat white with 1 sugar. Occasionally, in the afternoon I may go for a cappuccino instead. The flat white is truly a delight as the foam is a microfoam and really soaks up the coffee flavor so it isn’t too milky. I hope Logan House at Stanley is ready to perfect this for me. I’m serious. Someone tell them. I actually like Logan’s regular French roast brew and I look forward to brewing my own beans at home in my electric pour over. Hoping I can even buy some Campos beans in the USA?!?!?!? 6. 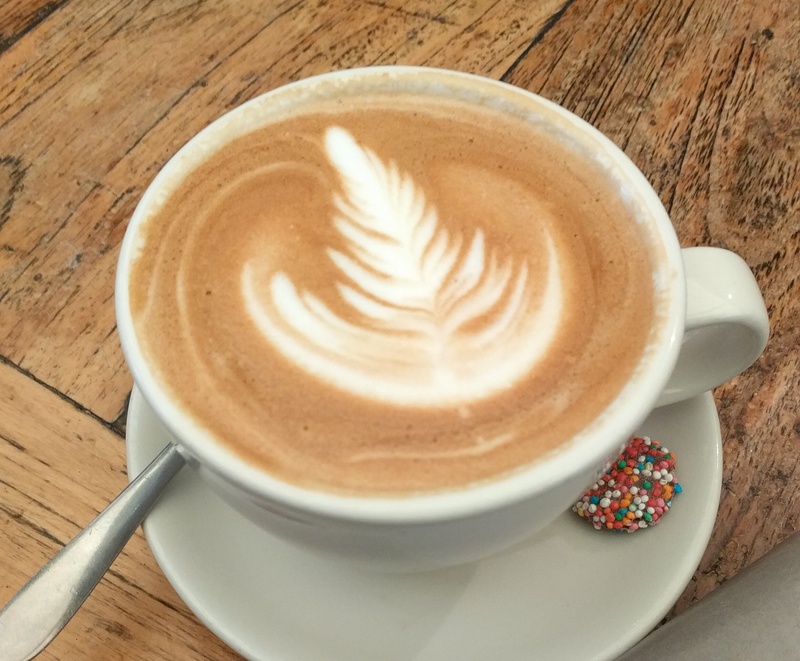 Babycino- Mae is working on a blog of her own where she reviews the BABYCINO scene in Australia. You won’t want to miss it! In addition to the beach, coffee has been a source of simple and great pleasure to me here in Australia. No matter what is happening, I’ve been able to depend on those 2 loves to happy up each and every day. Lucky me I don’t have to look far for either.